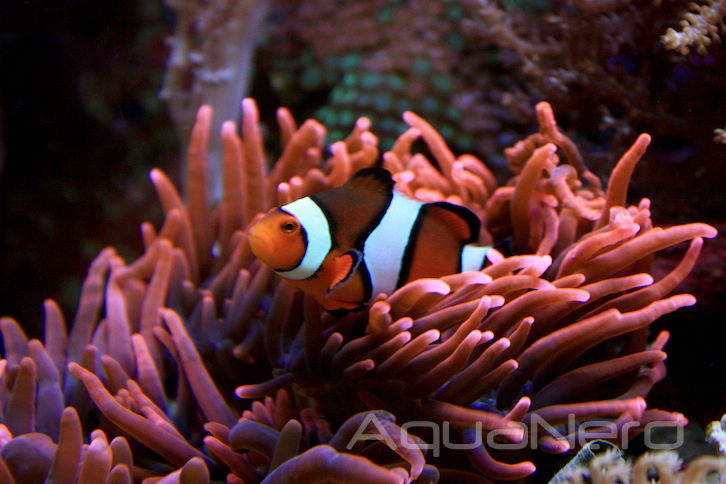 Pictured in the latest Picture of the Week offering from AquaNerd is a staple of the saltwater aquarium hobby…the Ocellaris clownfish (Amphiprion ocellaris) taking up residence in the tentacles of a rose bubble tip anemone (Entacmaea quadricolor). These clownfish, and the very similar looking Percula clownfish (A. percula) are very colorful and hardy fish that just about every hobbyists has owned at one point or another. The two species look so much like each other, in fact, that they are regularly confused for each other, especially when they’re still juveniles. One distinguishing feature we’ve noticed that helps us pick out the Ocellaris clownfish is the darker orange coloration. Percula clownfish, on the other hand, have a lighter orange and far more pronounced black borders around their white stripes.